Tired of mowing? Turn your lawn into a farm. Growing vegetables, not lawns, in your yard, for you and your local market. Volunteers at work in a front-lawn garden. Photo: Courtesy of Fleet Farming. 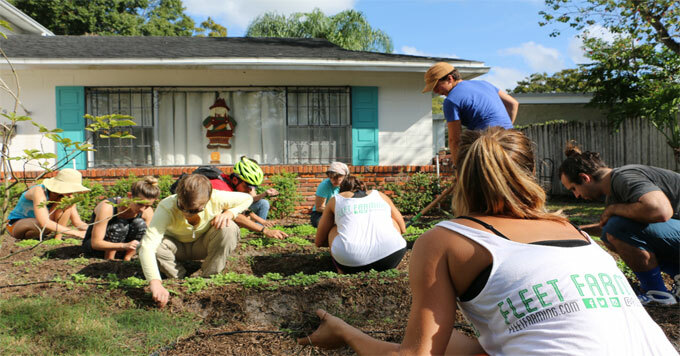 On residential streets in Orlando, Florida, where green grass once grew, some lawns have been replaced by neat rows of kale and baby lettuce. That’s Chris Castro, co-founder of a nonprofit called Fleet Farming, which plants and maintains gardens in people’s yards. Homeowners get to keep some of the food for themselves, then volunteers harvest the rest to sell at local farmers’ markets and restaurants. This hyper-local approach avoids the carbon pollution produced when vegetables are trucked long distances. To be even more climate-friendly, the group delivers everything by bicycle. And Castro says these little urban farms often use less water than the lawns they replaced. Communities across the country are exploring the idea. With growing concerns about climate change and interest in local food systems, the time seems ripe for urban farming initiatives like this one. And with 40 million acres of lawn across the country, there are lots of places where vegetables can grow.